It’s official. I’m now fully trained to cut down the same size trees I was cutting down quite happily before the four day training course I endured last weekend. Don’t get me wrong, I think that comprehensive training is necessary when working with dangerous tools and chainsaws are very dangerous. There are far more serious accidents in forestry than there are in the building industry. Comprehensive training is important but the thirty six hours of instruction on safely felling and logging predominantly oak, ash and willow saplings nearly finished me off. We didn’t actually start a chainsaw until day two. On day one we learned how to carry out a risk assessment of the areas where we work, assemble an effective first aid kit and put together a tool kit for every eventuality. We learned about chainsaw development from the first chainsaw manufactured by Andreas Stihl in 1926 (electric powered and weighing in at 140lbs) up to today’s relatively lightweight, more powerful and much safer saws. Our instructor Tim Rose, former poacher, gamekeeper, prison officer and now tree surgeon for eighteen years, really knew his stuff. He demonstrated all of the saw’s safety features, why we need to use them and what to do if they go wrong. He lectured us on fueling, safe practices, legislation, manual handling, the Health & Safety at Work Act 1974, Personal Protective Equipment at Work Regulations 1992, Management of Health and Safety at Work Regulations 1999, the Provision and Use of Work Equipment Regulations 1998, The Control of Noise at Work Regulations 2005, The Control of Vibration at Work Regulations 2005, the Approved Code of Practice (ACoP), the Control of Substances Hazardous to Health (COSHH) and the Sustaining Trees & Understanding Particularly Infectious Diseases (STUPID) act 2013 (I made the last one up). After the theory we were actually allowed to hold a real live chainsaw, but not to start it. Tim had brought a couple of his working saws with him, and both had particularly blunt and battered chains. Tim then explained, in mind numbing detail, the anatomy of the chain. He told us about the witness mark, top plate, side plate, working corner, gullet, depth gauge, toe and heel. He waxed lyrical about the difference between and full and a semi chisel cutting heads, cutters, drive links, guard links tie straps and rivets. With the finer points of chain composition finally exhausted he very kindly allowed Pat and I to spend an hour sharpening his blunt chains. Oh, what fun we had! Finally, after twelve hours tuition, we were allowed to take our chainsaws into the woods. We spent the rest of the day working next to our reed bed filtration plant cross cutting half a dozen oak which I had felled earlier in the week. We learned about tension and compression, the correct sequence of cuts, the dangers of kickback, correct posture and grip, pulling and pushing chains and when to use them and, most importantly, how to pay attention and look interested so we didn’t hurt Tim’s feelings. On day three we spent the morning practicing our felling techniques… but not on living trees. Tim strapped two 2m oak logs vertically to two nearby willows so Pat and I could spend a couple of hours practicing cutting “sinks”, the wedge shaped pieces which are cut out of the tree to determine the direction of fall. 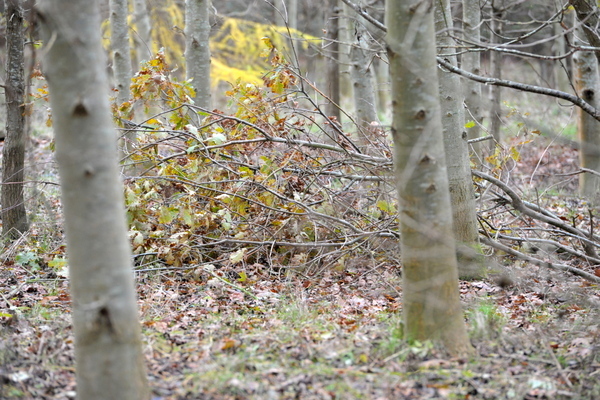 In the afternoon we ventured further into the woods to fell our first trees. We spent a couple of hours discussing what we needed to do before felling the 10m high oaks. The reason we are removing so many oak, apart from the damage done by the squirrels which has resulted in the crowns dying, is because our 1,500 oak are far too close together. Most of them are no more than 2m apart which means that they don’t have room to grow and that they are all competing for a limited amount of water. The fact that they are so close together means that the one which need to be removed are quite difficult to fell without getting “hung up”. A hung up tree is one which falls against an adjacent tree and stays there. I felled an oak surrounded by other oak and ash which immediately hung up. Tim then spent the best part of an hour describing the methods which could be used to safely put the tree on the ground. He finally came to the conclusion that the best remedy for the problem would be to attach a robust strap to the half-fallen trunk, run the strap through a pulley strapped to a nearby ash and use a ratchet to ease the tree into the horizontal position. Given that I didn’t have any of the necessary equipment and, to be honest, didn’t understand at all what Tim was suggesting, I waited until he left for the day, picked up the troublesome oak and carried it out of the woods. On the last day we concentrated on felling oaks although, with frequent breaks for review and correction, we didn’t fell very many. We finished the course at about 3pm on Sunday after cutting down a total of eight oak and two willow out of the twenty five trees I had reserved for the course. So now the course has been completed. Both Pat and I have passed and are now certified in chainsaw maintenance and crosscutting and basic felling techniques on trees up to 200mm in diameter. Do I think the course has been worthwhile? Yes I do. Every minute of it. I was pretty confident felling trees before the course, but possibly for the wrong reasons. Since last Sunday I’ve spent a couple of days on my own in the woods both felling and crosscutting. The techniques which were repeatedly drilled into us have stuck with me. As a result I’m now less of a danger to both myself and those around me and, because of the techniques I learned, I can use a chainsaw for longer with far less fatigue. I’m grateful to Tim for sharing his extensive tree surgery knowledge with us, but I’m even more grateful for the encyclopedic knowledge he shared about woodland management. Tim’s first experience with woodlands began over three decades ago as a teenage poacher. He then legitimised his woodland exploits by becoming a gamekeeper and then a tree surgeon. He knows a huge amount about the balance which needs to be achieved if the woodland is to develop into something which is both aesthetically pleasing and a haven for a rich variety of birds, insects, reptiles and mammals. Tim told me that, although there are plentiful signs of both flora and fauna in our larger six acre wood, it is what is described as a “cold” wood. A cold wood is one which has a top layer, a canopy, but no mid or bottom layer. Our wood is predominantly oak and ash with a few conifers and other marginal species thrown in for good measure. There is no understorey (mid layer) or ground cover. The animals which venture into the wood don’t stay for very long because they feel exposed. There are plenty of signs that animals have passed through the wood; there is, of course, the extensive damage done by grey squirrels to the oak canopy, then there are marks left low down on tree trunks by rabbits, hares and muncjack deer and, slightly higher up, by roe deer. Tim told me – and he kept a very straight face – that the muncjack marks are made by sexually frustrated bucks who are prevented from getting anywhere near the does by the dominant buck. There are signs that they have passed through but passed through too briefly. The easiest way to provide quick and effective ground cover is to use the brash, the twigs and smaller branches, from the felled oak. It’s a win/win situation for me and for the wildlife. They get plenty of ground cover and, rather than having to drag the brash a couple of hundred metres to the truck, load it up, drive to the tip and unload it again, I can leave it close to the felled trees in tidy piles. The remaining stumps or stools from the felled oaks will also help to provide ground cover. Early next year the stools will produce new shoots which will initially give cover close to the ground and then, over the coming years, grow into an understorey layer. With some ground cover in place, I just needed to find a solution for the missing understorey. Next week I’ll be planting some. On Wednesday I hope to take delivery of 270 mixed holly, wayfaring tree, spindle, hazel, field maple and crab apple. It’s not enough to cover all of the woods, but it’s a good start. I’ve only just stated to use the brash from the felled oaks as ground cover. Most of it had already been removed from the woods before Tim visited us last weekend. Some of it had been burned. I didn’t like burning the oak branches. I thought it was a shame to see it go up in flames. 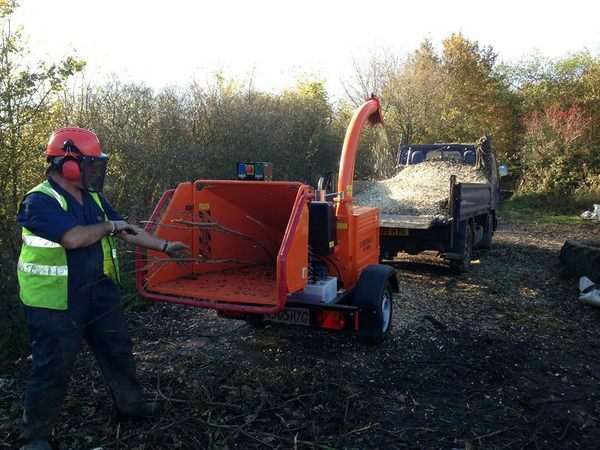 We use a fair amount of bark chippings around the site on paths and to suppress weeds around shrubs. A rubble sack full of chippings costs about £60. I knew we could save this cost if we chipped the large amount of brash we generate in general from site maintenance and in particular from the oak felling project. I persuaded the powers that be to hire a professional chipper for the day. Early on Tuesday morning I drove twenty miles to West Haddon in Northamptonshire to pick up a professional Timberwolf chipper. It was a beast of a machine. We fed the brash from about forty oak and half a dozen willow through the machine – plus a couple of arm-fulls of very painful to handle blackthorn – over six very intensive hours. The end result was four truck loads of chippings, or about ten rubble sacks, numerous cuts and scratches and absolute exhaustion. Patrick and I don’t work together very often. I think we’re both a little antisocial. But on the days we are together we tend to be quite competitive. Feeding the chipper was quite demanding physically, as was wrestling the branches off the bonfire which I had compacted with our small excavator. The hob’s been done now though and I’m delighted with the end result. The brash from the felled oak has been processed so that it can be put to use in and around the woods. 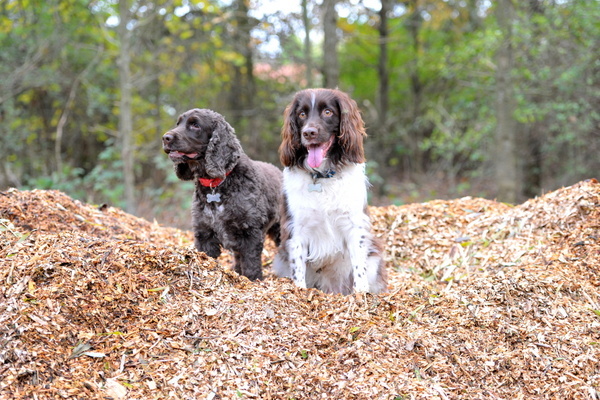 Chipping Mountain has also added a bit of interest in the woods for Charie and Daisy. I took them to explore it this morning (below). I’ve strayed from the usual newsletter subjects this week but, because the chainsaw course took up all of my free time last weekend, I haven’t had an opportunity to think about, research and write any other subjects. As living on a narrowboat, for me anyway, is all about being able to live a quieter, more peaceful life close to nature, I thought that you too might be interested in the wonderfully rich nature which surrounds me. After I’ve finished planting 270 new saplings next week the short term projects in the woods will be complete. I’ve removed 120 damaged oak to give the healthy oak more space and coppiced about fifty goat willow. In the process I’ve logged and split enough wood to keep me warm for a couple of years. Talking of keeping warm, did you know that the government would like to help you out with your winter fuel bills, even if you’re living afloat? If you are over 62 and otherwise meet the government’s criteria for winter fuel payments you’ll receive £200 towards your heating costs regardless of whether you live on dry land or on the water. If you have a house and a boat, you won’t receive payments for both. The payment is per property rather than per person so if you share your home, floating or otherwise, with a girlfriend/boyfriend/wife/husband each of you will receive £100. There’s information about how to claim for the winter fuel allowance if you use a friend’s or relative’s address as a postal address on the Association of Continuous Cruisers web site here. Please note that they state that you can receive the winter fuel payment if you are over sixty. However, the qualifying criteria is that, for this winter’s payment, you were born before 5th January 1952 which means that you need to be closer to 62 than 60 before you qualify. Sadly, or maybe I should say happily, I won’t qualify for another nine years, which is a shame considering that my total expenditure for coal last year was £888. Kim Wainwright, Deckhand on the forum, registered for this site in April this year while she waited for her own boat to be built. Now she’s living the dream on her new narrowboat Progress with her ex corporate high flyer husband Jim and their five dogs. They’ve been living afloat now for a month and love every minute of it. Here’s their story.